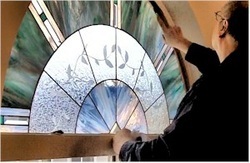 First thing that needs to be done, is getting the existing window perfectly clean, which Jeanne is an expert at! 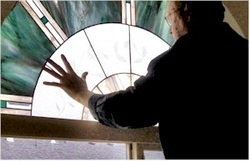 Then, I raise the window in place to check that it fits. Here I'm sliding it so that each side has the same amount of gap. I add cardboard shims to raise the panel up so that it has the same gap both top and bottom. A cardboard wedge holds the top in place, keeping the panel from tipping out. I fold the cardboard in an "accordion" fashion to form the wedge that goes in the top. 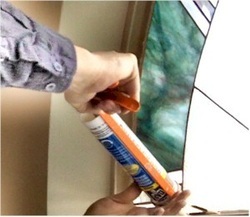 Once the final cardboard is holding the panel in place, we're ready to caulk the window in. 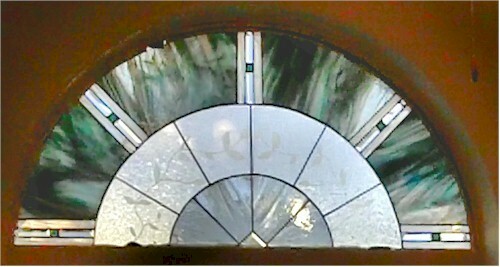 I use a tile and tub caulk that matches the color of the window frame. 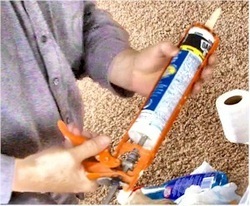 As I apply the caulk, I use care to get the caulk in smoothly, but I don't worry about imperfections yet. 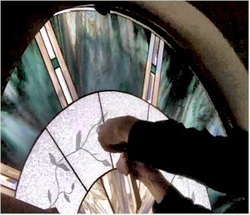 It's important to use caution as you apply the caulking so that you don't force it into the back of the stained glass. 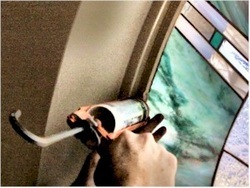 There is nothing to prevent the gap behind the window from getting too much caulking in that void. 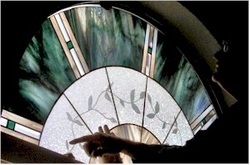 This would result in an ugly look and the only way to fix it, is to take the window out and start over, which is just a huge mess. 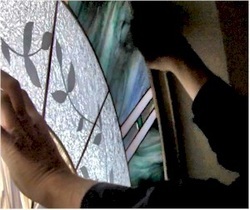 Once the caulk is applied, I take a wetted finger and smooth the caulking. I find that a roll of toilet paper is a great cleanup tool, it works great and it doesn't cost much! 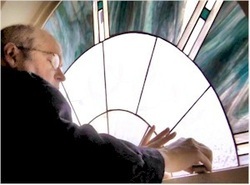 When I get the entire window caulked, we'll leave the caulking to harden and then we'll come back, take out the cardboard, fill the gaps with fresh caulk and scrape any excess away with a razor knife. The finished install is very satisfactory. The clients love it and are pleased. We've found that as we do more and more installs that the pressure and anxiety that used to build during an install has diminished over time and we almost enjoy the process!